Dog Racing Is Cruel. Let's Celebrate the Fact That Its Days Are Numbered. When I was much younger, one of my father’s favorite activities was to attend races at the local dog track. He wasn’t alone. Millions of people have bet on and attended dog races over the years. Luckily, this cruel practice is coming to an end, though not swiftly enough. The first official racing track was built in California in 1919, but it wasn’t yet legal. Interest in this “sport” grew, and track owners realized that racing had the potential to become a big money-making event. In 1927, a petition to legalize dog racing was brought before the U.S. Supreme Court — and denied. Despite that, by 1932, Florida had legalized dog racing. By 1935, 10 tracks were in operation. By the end of the 1980s, dog racing was legal in 18 states. Supporters actively promoted racing and included people from all walks of life. Even celebrities attended events and supported racing, such as Joe DiMaggio, Babe Ruth, Lou Gehrig, Burt Reynolds, Janet Leigh, Tony Curtis and Frank Sinatra. Less savory supporters included the mafia, and it was rumored that several leading mobsters had connections to various tracks. Dog racing caught the interest of the media during several strikes made in the 1970s. Breeders, kennel operators and other people involved with the handling and racing of the dogs (usually lumped together under the term “dogmen”) went on strike several times in an effort to gain a higher percentage of profits off of the dogs. The media attention would bring to light the plight of the dogs involved in the sport. 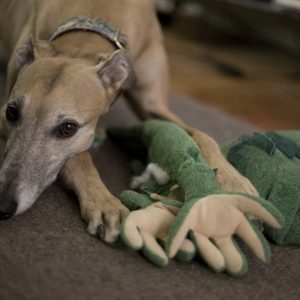 In Arizona, for example, over 100 ex-racing Greyhounds’ bodies were discovered buried in a lemon grove. When they could no longer race, they were shot and buried. Stories like this began cropping up more frequently, and, gradually, the public began pushing for change. 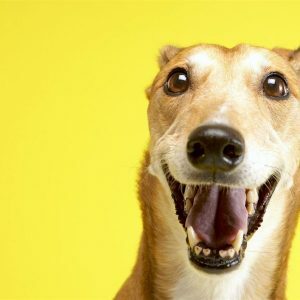 *In November 2018, voters in Florida approved Amendment 13, which will end live Greyhound racing in the state by 2021. 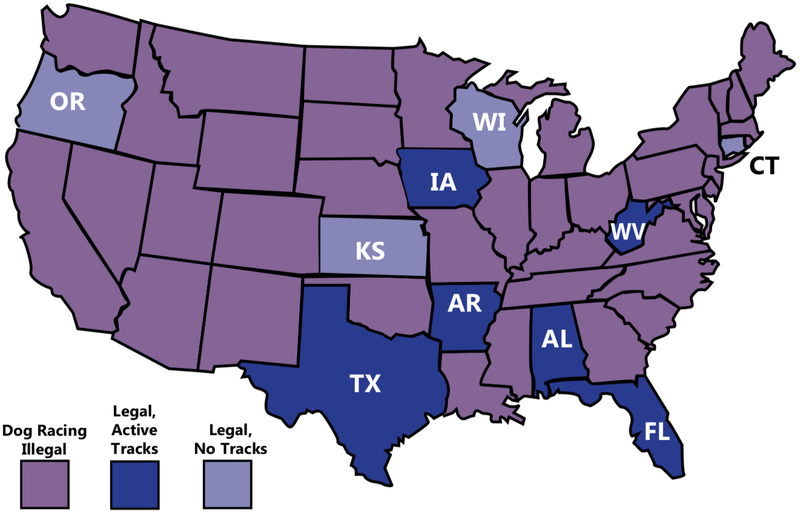 This map shows where dog racing is still legal in the United States. Florida will end live Greyhound racing by 2021. Map: High Stakes; updated by Petful, October 2018. 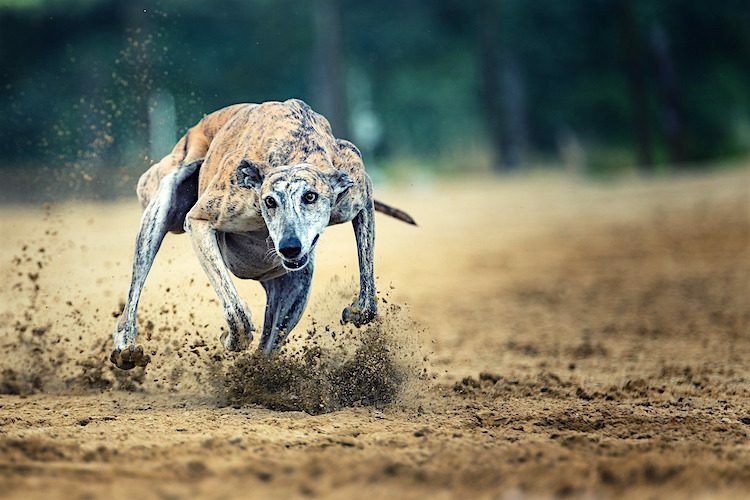 Racing dogs — most often Greyhounds — are not given free rein on their off days. Rather, when not racing, they are kept confined and sometimes muzzled. Some dogs are released for a short period every day, but this is usually limited to anywhere from a few minutes to 2 hours at most. This means that, when not racing, these dogs are confined in cages in which they cannot even fully stand. Greyhound racing takes a toll on the dogs, and injuries are common. According to the High Stakes report, more than 11,000 injuries were reported between 2008 and 2014. Broken legs are the most common injury reported, at 36% of all reported injuries. 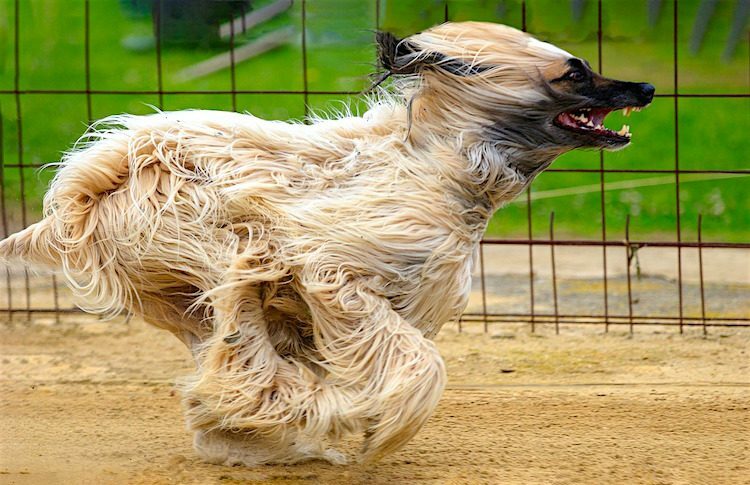 Injured dogs sometimes cannot recover adequately to race again. Between 2008 and 2014, over 700 dogs were euthanized due to injuries. Female Greyhounds are given anabolic steroids to prevent them from going into heat. Frequent use of steroids can cause aggression and other issues, which can lead to weight gain and virilization. 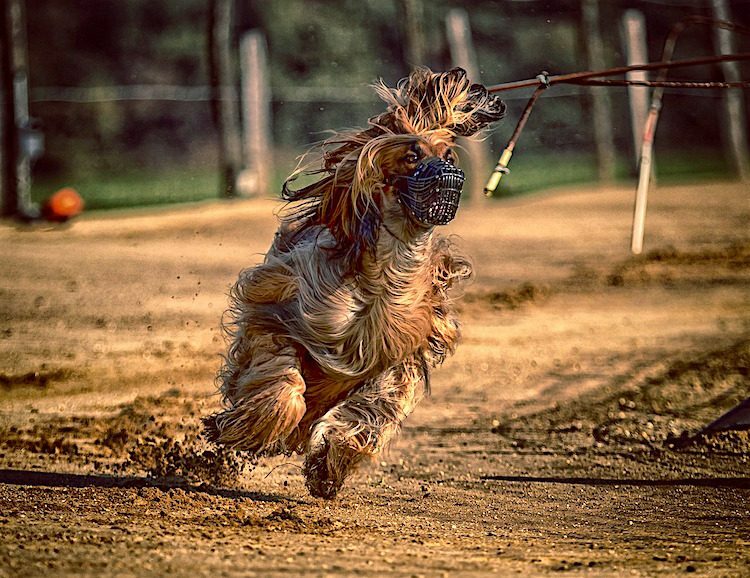 The drugs may also enhance performance, making it doubly appealing to breeders and keepers who profit from the dogs. In 2008, South Tucson passed legislation banning the use of steroids, but it had little effect. These dogs are so valuable in terms of potential profit, you’d think they were at least fed well, right? Wrong. Feeding the dogs such poor-quality meat may introduce pathogens like salmonella and E.coli into their diets, and can lead to false positives in drug screenings. In other words, dogs foraging on the streets probably eat better than these Greyhounds. Unsurprisingly, there are several noted cases of animal cruelty and neglect in the dog racing industry. A Greyhound named Where’s Fly In broke his leg and shoulder during a race at Palm Beach Kennel Club. A kennel helper named Loyce Metcalfe took Where’s Fly In directly to the track veterinarian, Dr. Neger. According to Dr. Neger, he advised Metcalfe that the dog needed to be transported to an emergency veterinary practice for additional care. However, the dog’s trainer, Michael Marsella, waited until the following morning to attempt to obtain emergency treatment for the dog. Marsella arrived at the practice on the morning of July 14 to find that the facility was not yet open. He then left Where’s Fly In in his transport truck while he schooled the other Greyhounds in his kennel. When Marsella returned to the veterinarian’s 30 minutes later, he found Where’s Fly In dead in the truck. 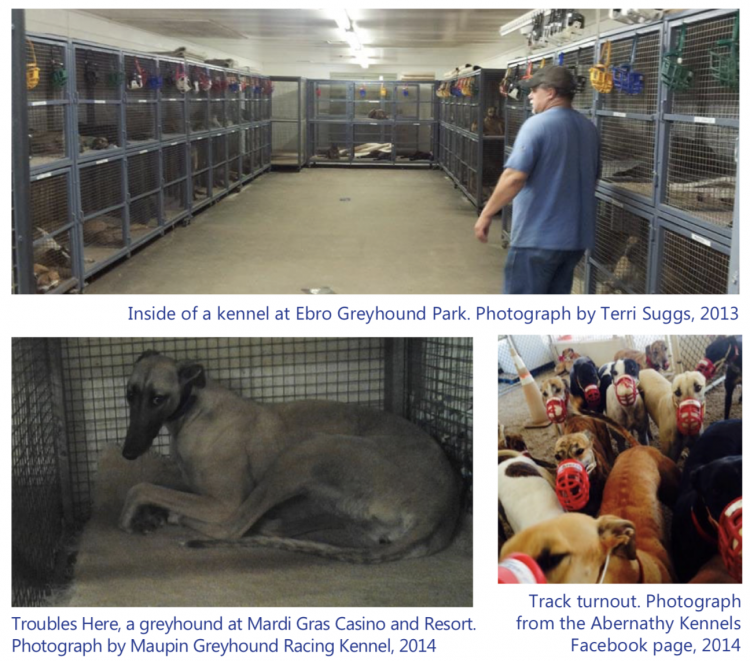 State investigators discovered 37 dead Greyhounds during an inspection of the Ebro Greyhound Park kennel compound. Five other dogs were alive but severely emaciated, including one who couldn’t stand up. Many of the dogs were double crated, and some had silver duct tape wrapped around their necks. The tape was wrapped so tightly it could not be cut off and had to be unwrapped. A necropsy later determined that the Greyhounds died from dehydration or starvation. A week after the dead Greyhounds were discovered, Washington County Sheriff Bobby Haddock stated it was the “worst case of cruelty to animals” he had ever seen. There are countless more hideous and heartbreaking incidents like these listed in the High Stakes report. More alarming is the fact that in at least 6 states, racing is still legal, which means any and all of the above is likely still occurring today. Some other frequently reported issues in these dogs include a lack of up-to-date vaccinations, poor transport facilities, dirty and unsanitary kenneling conditions and the hiring of convicted violent felons and animal abusers to work with the dogs. Dogs are often bought and sold within the United States, but they are also sold to buyers from other countries that do not have strict humane policies when it comes to animals. Yes, dog racing is cruel — so why does it still exist? Because the dog and track owners make a profit. The conditions and treatment of the animals is clearly not a concern for many breeders, track owners and profiteers. While there are, of course, some who take care of their racing animals, these men and women are too few and far between. Far more frequently, these Greyhounds live a short and painful life. When the dog can no longer race, they may be lucky enough to be adopted via one of several rescue groups. But too many simply are euthanized when their “usefulness” comes to an end. 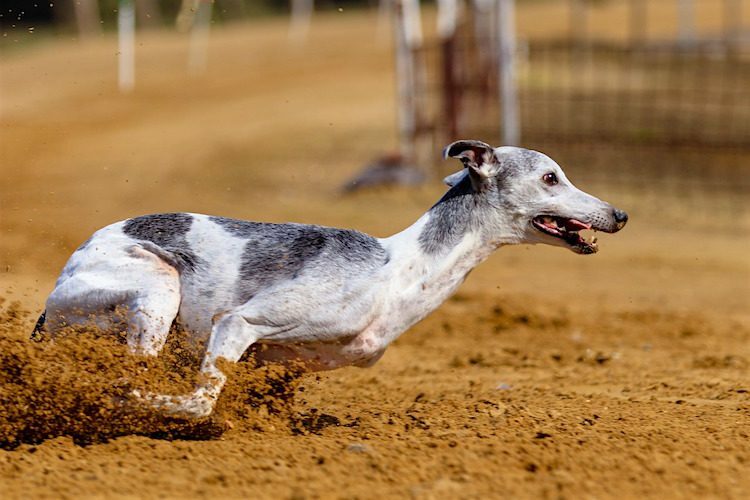 Help stand up against the states that have yet to enact legislation banning dog racing. Don’t bet, don’t attend, don’t support — and, most of all, speak out. Keep showing these images and stories of the dogs. Help stop dog racing abuse, and give these animals what they deserve — a loving home. Read the High Stakes report here — and please share the information.